More than 200,000 contestants and supporters from across the world will descend on the East-Central German city of Leipzig for the WorldSkills 2013 this week. The 42nd competition will kick off with a spectacular opening ceremony tomorrow in the city’s Samsung Arena. The official ceremony will mark the start of four days of competition that will end on Saturday. Competitors aged between 17 and 22 from 53 countries and regions will make up some of the 1,000 young people competing across 46 disciplines that range from hairdressing, cooking, refrigeration and aircraft maintenance to floristry and stonemasonry. From Wednesday competitors will start four days of intense tasks and challenges that will be scrupulously observed by the official WorldSkills judges. They will go through every detail of the competitors’ work to find those worthy of a WorldSkills 2013 medal. FE Week spoke with Michael Godfrey, Team UK training manager for cookery and executive head chef at Eton College, shortly before he left for Leipzig. Commenting on the toughness of the challenges and the judging process, he said: “The level of performance from the competitors is incredibly high. They can miss out on a medal by a fraction of one point; it really can be that tight. The WorldSkills Competition is the flagship event of WorldSkills International, a membership organisation of 65 countries and regions, including Malaysia, Singapore, Iran and New Zealand. The organisation now represents more than 70 per cent of the world’s population and continues to grow. Thirty-four young people make-up Team UK. Following a farewell and good luck send-off at the British Film Museum on Friday, they flew off to Leipzig on Saturday morning. The international final is the culmination of months of intense training and selection heats. This is the second appearance in an international competition for some UK competitors, such as Hannah Clague, who is competing in hairdressing. She achieved gold last September in EuroSkills 2012 and is a strong contender for a medal later this week. WorldSkills is held every other year. Organisation members take turns in hosting — the 2011 competition, held over four days at ExCeL in London’s Docklands, was the world’s largest skills competition and careers event ever held. In 2011, the UK came fifth in the medals table, achieving four gold, two silver, six bronze and 12 medallions of excellence. Top of the countries and regions was Korea with 13 gold, five silver, six bronze and 12 medallions of excellence. 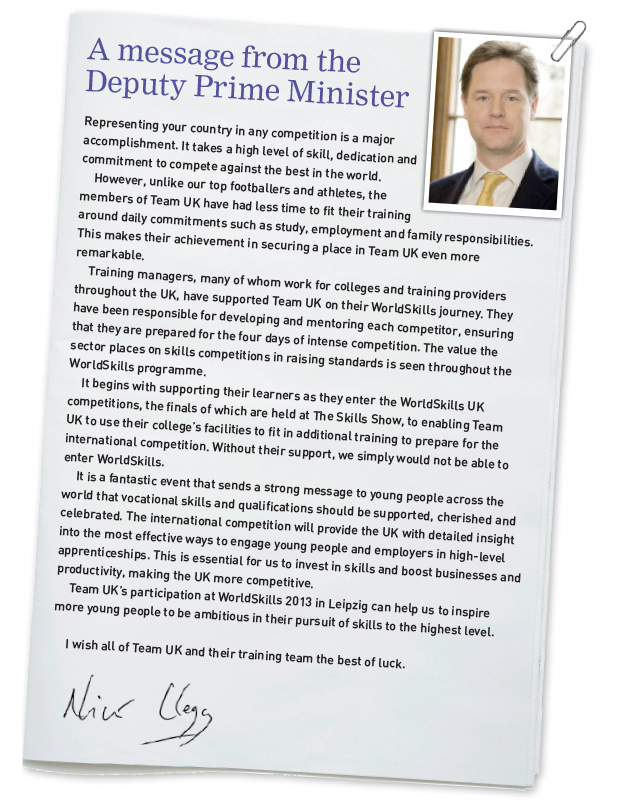 Shadow skills minister Gordon Marsden told FE Week: “As someone who has backed our participation in WorldSkills from the start it is great to see another fantastic team go to Leipzig to fly the flag for Team UK. For many the prospect of cooking a Sunday lunch is enough to get them in a fluster. But for Louisa May Matthews, cooking Sunday lunch for the family is a breeze when you are used to catering for more than 1,300 pupils at Eton College. But on June 29 she will face a challenge when she flies out to Leipzig, Germany, to represent the United Kingdom in cookery at WorldSkills 2013. Before starting work at Eton three years ago, Louisa kicked off her training at Worcester College of Technology where she studied a professional catering VRQ diploma level one, two and three. Last Tuesday she took a brief break just before lunchtime service to give me a whistlestop tour of Eton and to chat about this week’s contest. We paused to take in Eton’s grandeur, standing beside a statue of founder King Henry VI between the chapel and a boarding house. “Working in such an environment took some getting used to, but I love it,” she said. “I arrived when I was 19 and in the three years I have been here, the level of support the college has given me is unquestionable. “The whole community here has been amazing. They knew I was a competition chef when I started, and no matter what the competition, they’ve been there congratulating me. She said that during the Leipzig contest, she will be assessed on eight modules. She knows six of the dishes she has to make, but the other two are a mystery “although we know one of these will be a fish dish”. She said that over the recent weeks the team had developed a strong bond. “It truly has become a team. We are always in touch with each other on social networks such as Facebook and Twitter,” explained Louisa. Then, as if by magic, the college’s director of catering, Ian Warwick, strolled past. He was postively beaming as he explaiend how “very proud” everyone at Eton was of Louisa. “Representing Eton and the UK is such an amazing achievement in itself. We will all be rooting for you next week,” he said.